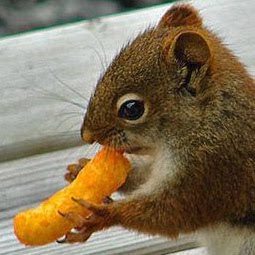 Cheetos for Breakfast: Monkey See, Monkey Do? If you are married, how did the marriage (or lack thereof) that you grew up with influence your marriage now? On a related front, if you have children, how did that marriage influence how you raise and relate to your children? To be really specific: IF your parents divorced, what impact does that have on your marriage and your parenting? To be really, really specific: IF your parents divorced, do you find yourself holding your breath until you have been married longer than your parents were? I think every person, no matter how awful or wonderful their family of origin, enters adulthood, marriage and parenthood with an idea of what they want to repeat and what they want to change. I certainly did. Mostly, I wanted to change things. My parents didn't have a good marriage. They managed to stay together for 31 years and 11 months, but it was not a good marriage. I may or may not, one day, make my best attempt at a detailed analysis, but I know that my conclusions would be skewed by limited information and my own subjective experience. But as I moved my way toward adulthood and seeking a husband for life, I already had in my mind so many ways I wanted things to be that were different from my parents' experience. On the whole and by the grace of God and with the help of my most awesome husband, I have experienced a marriage beyond my imagination. There is nothing like sharing my life, my whole life, with my best friend. When I have been fed up on a husband/wife level, I have hung on anyway because, after all, he's my best friend and what would I do without my best friend? I know that this level of companionship was not something that my parents ever had. On a scale of 1 to 10 (10 being darn near perfect) I would currently put ours at perhaps an 8.5. Room for improvement, but overall a pretty good thing. Yet with all of this goodness given to me, I get uneasy. The other day I was thinking about how we are closing in on being married for 24 years. Statistically speaking, that's pretty good. Yet I was struck with terror. My parents were married for almost 32 years. Twenty-four doesn't mean anything, it doesn't guarantee anything. If my parents could throw in the towel after 32 years......All the marriage books and all the sermons and all the articles and all the counseling in the world still doesn't take away that uneasiness for me. In my world dads leave and moms are left holding the bag and cleaning up the mess. That is just one example of how my personal experience still colors my marriage. Parenthood isn't excluded either. Matt always remarks how I tend to take on more responsibility than is actually mine, especially when it comes to parenting and guilt. Only today was I able to explain to him that when I say that I feel like I've failed as a parent because I didn't do this and I didn't do that, that I'm NOT saying this because I feel he has no right or no role with my children, I am saying this because this is all I know. My father was absent physically and/or emotionally for most of my life. Other than the dispenser of the really, really hard spankings (in my tender tush experience), he pretty much had very little role in my life. In my experience it all falls on the mother (and is therefore always the mother's fault). Sometimes I even forget that there is a role for the dad in our family because I don't really know what dads do. Again, it isn't that there aren't enough books out there to detail every jot and tittle of family life, it is just that, when the rubber meets the road, it's a case of Monkey See, Monkey Do. I know that God is in the business of changing lives and changing patterns. But I think he usually does this by first pointing out to us that which needs changing in the first place. How can we give him the glory if we don't even know what he has done? If we aren't aware of the influences in our lives, we aren't aware enough to ask, "Am I doing what is best or right or healthy or am I doing what I know?" For some of us it is a matter of having to drive the truck out of the well worn rut and blaze a new trail. The comment above was posted by a friend of mine, and I have quoted his line about "the madness stops with me" on several occasions. I think that if we're aware of the things that are shaping us, then we have the power to decide to take another path. I don't see my own parents' marriage as an influence of my marriage nearly as much as my first marriage. Better to learn from my own mistakes than to look to the shortcomings of my parents' marriage. I agree with "the madness stops with me" approach. What I was trying to point out is just that sometimes you can get years into a marriage (or parenthood) and still not realize the little ways things like your experiences impact you. I went through the entire "I'm gonna do everything different" approach with parenting, or at least I really WANTED to, only to have shockingly heartbreaking results (see Flannery Meltdown). My parents (as you know) are not divorced, have been married for 39 years. But my dad is a perfectionist and a control freak (though he does not realize it, and will never admit it). I was so determined not to raise my kids the way he raised us, however, I so often heard my dad coming out of my mouth and saw him in my actions, I have had to actually take parenting classes to help me figure out a different way of doing things. Dad was always right, (supposedly) so it took a lot to get me to believe it was ok to do things an ENTIRELY different way, rather than trying to just soften his way. It has been very hard too, living so close to him (but I've gotta have my mom, she's my best friend ever) and having him tell me I'm ruining my kids cuz I won't listen to him and do things his way. (He says "the right way" but it really is just his idea of what should be done.) Anyway, I hope this doesn't affect any relationship you may have with my parents, but I want you to know I do understand how you feel, and the frustration of -like you said - monkey see monkey do. It takes focused determined effort to not be your parents. However, you do have a husband completely different from your father, so that is a good start to changing how your family works! Love you! My parents marriage was filled with violence, anger, nagging, abuse of alcohol, abuse of each other and some good times. It usually wasn't pretty. They celebrated their 25th anniversary 8 months before my Dad left to live in a tent with his girlfriend. I thank the God of all hope that by His Grace I have no reason to believe that any of this should affect my life with my husband and family. When I begin to respond the way my parents responded, either according to experience or in response to my "feelings" I need to remember that, and confess my sin (whether it be disrespect, malice, despair, laziness...you name it) and repent, committing to put off those things and put on the new...hope, speaking encouraging words, forgiving others, kindness, compassion,diligence. Should we, who are in Christ, believe the world and the thousands of conflicting opinions regarding our marriages, or should we not pour over the scriptures to see what God has to say. The more we know the mind of God and, by his spirit, are conformed to the image of Christ, the better all our relations will be. None of my life is without trials and suffering, not marriage, health, child rearing or memories of past, etc, but I have discovered that God didn't promise relief He promised VICTORY and that gives me a lasting hope. So Y'all Want Me To Write, Huh?